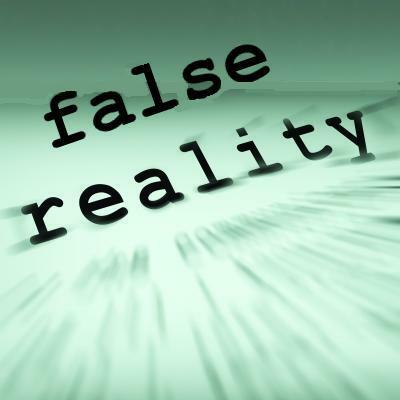 From several recent conversations, it is apparent that there are some who find the idea that they are surrounded by a false reality just too hard to wrap their heads around. “One day I get up. I get dressed. I get in my car. I put the key in the ignition and I start it. I go to the grocery store. I park and go inside. I buy a cart full of food and go home. I take the food inside and put it away. Everything I’ve done, I know I’ve done. I know it’s all real. By describing a series of physical tasks–and ONLY physical tasks–the person partially answered his own question. At least about his own little, personal piece of the universe. When many Americans think about reality, they boil it down to a series of familiar, physical actions or behaviors. BUT living in a false reality can be illustrated with a very simple example. Suppose you believe you are living the good American life: good job; kids are well-behaved and doing well in school; happily married for 10 years; nice house. NOW suppose you find out that your spouse has been carrying on a long-standing affair with another for the past 10 years. Suddenly, your life seems to be a lie: what you thought was a major plus in your existence (happy marriage) is a HUGE minus (unfaithful spouse from the beginning). Your reality has changed drastically, EVEN THOUGH NOTHING YOU HAVE DONE PHYSICALLY HAS CHANGED. So many points of reference in your life are NOT what you supposed them to be. NOTHING you have done has changed. You still get in your car and put the key in the ignition and it starts and you drive to work. But EVERYTHING about your existence has now changed. Everything you previously used to evaluate your happiness; your success; your LIFE has changed forever–and much for the worse. Again, NOTHING you have done physically has changed. But you find out that your entire foundation was rotten. Even though you are numb, you struggle to find something familiar to grasp onto in order to begin over. You realize that you were living in a false reality: that the reality you THOUGHT you had in no way matched what was actually taking place. ALL can be asked of anyone who discovers their version of reality they have constructed does not match what is really happening in their life. NOW, imagine that this is taking place all around you in practically every home and family in America. Imagine that millions of Americans DO NOT have the life they believe that they have. Jesus Christ repeatedly warned of deception in the end times. Americans KNOW the deception is real. In fact, Americans are aware of the deception every day. But most pretend not to notice and continue along as if everything is as it should be. But Americans want to live a life that is a fairy tale–even those who imagine themselves to be hard-core honest people. ONE DAY SOON, most of America will be startled out of the lives they imagine they have. Most Americans will believe they have turned the corner and their dreams really can come true. And shortly thereafter, an even ruder awakening will take place. IF ONLY they had believed Jesus Christ. IF ONLY they had believed God’s Word. IF ONLY they had a love for the truth. There will be more than a few who will believe God to be unfair because he lets end times men believe the lies they want to believe. IF ONLY those men had had a love of the truth. But because so many will have made their peace with lies; because so many will have not only winked at deceptions in their everyday lives BUT will have assisted in those very same deceptions: they will be deceived about the most basic things–RIGHT UP UNTIL it is too late and Jesus Christ returns to earth. The things most people do not know–actually, the things most people DO NOT WANT TO KNOW–are the very things that those same people will use to construct their own false realities. DOES the reader believe that life is generally okay and when the going gets tough, things will “get better“?